Adore is the fourth studio album by American alternative rock band The Smashing Pumpkins. Virgin Records released the album on June 2, 1998 in the United States. Adore was the Pumpkins' first album to not feature original drummer Jimmy Chamberlin. Adore marked a change in sound for The Smashing Pumpkins; Greg Kot of Rolling Stone magazine noted that the album "isn't just a transitional record; it's a complete break with the past." Their previously layered, guitar-oriented sound was largely replaced by a quieter and more electronic influenced sound, and incorporated drum machines and synthesizers. For the release, the band shed their alternative image for a more subdued Gothic look. Corgan was quoted as saying 'that Adore will play like a concept album, but with no concept.'. 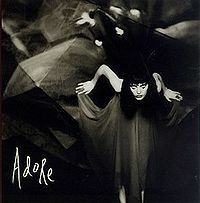 Despite being called "one of the most anticipated albums of 1998" by MTV, Adore sold only 1.1 million copies in the U.S., far below the Pumpkins' previous albums Siamese Dream and Mellon Collie and the Infinite Sadness. However, the album was well received by critics, and became the third straight Pumpkins album to be nominated for the Grammy Award for Best Alternative Music Performance. Billy Corgan would later characterize the album as "a band falling apart."